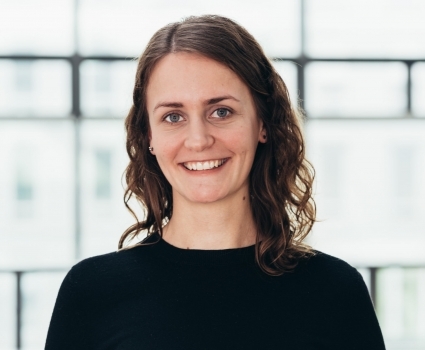 Viktoria Brüggemann is a research associate at the Urban Complexity Lab at FH Potsdam. Her emphasis as a cultural scientist is mainly on cultural history and museums, with a focus on different ways of knowledge sharing in the present. Viktoria holds a Bachelor degree in Kulturarbeit (cultural work and arts management) from FH Potsdam. During her studies, she focused on cultural history as well as arts management and participated in different projects, for instance a cultural exhibition named “In the Jungle of Hair” at the Grimmwelt Kassel, to which she contributed a video installation. From 2013 to 2016, she worked for the Humboldt Lab Dahlem, an interdisciplinary project at the Staatliche Museen Berlin which provided impulses for the exhibition planning of the Ethnologisches Museum and the Museum für Asiatische Kunst for the future Humboldt Forum. Viktoria is currently enrolled in the Master program European Cultural History at the European University Viadrina. How is exploration manifested in online collections of museums? Der Beitrag stellt einen vom Theodor-Fontane-Archiv der Universität Potsdam in Kooperation mit der Fachhochschule Potsdam entwickelten Prototyp zur explorier- und skalierbaren Visualisierung einer Autor*innenbibliothek und der darin enthaltenen Lektürespuren vor. Ziel ist die Verbindung gestaltungsorientierter Ansätze zur Visualisierung kultureller Sammlungen mit philologisch-, archiv- und bibliothekswissenschaftlichen Forschungsfragen. 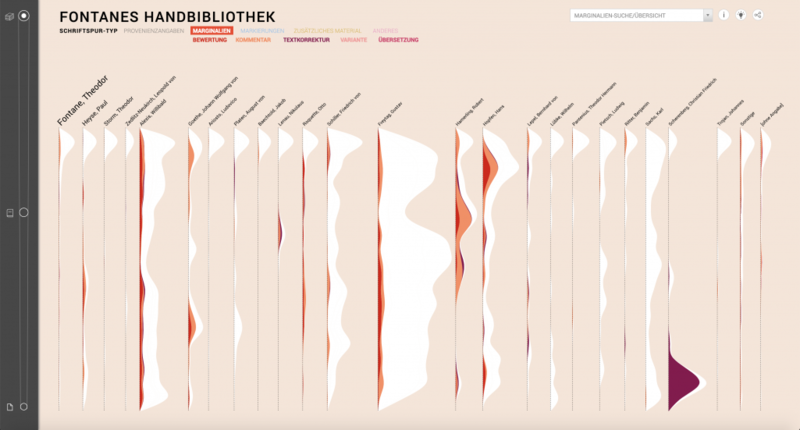 Das im Projekt entwickelte Visualisierungskonzept legt einen besonderen Fokus auf die kontinuierliche, auf mehreren Granularitätsebenen zoom- und filterbare Navigation innerhalb einer Autorenbibliothek, die die Erkundung einzelner Objekte ebenso zulässt wie deren Vergleich. Die Erfahr- und Erfassbarkeit der Sammlung als Ganzes und der sich in ihr abbildenden Lektüre- und Benutzungsmuster stehen dabei ebenso im Zentrum wie Zugänge zu Einzelphänomenen. Museums are broadening their program beyond the physical institutions by providing digital collections online. In digital collections, objects are prepared and presented particularly for the Web and the ambition is to provide the entirety of a physical collection. To make these rich and comprehensive data sets accessible, an explore mode is increasingly offered. The present study considers this mode, first by making sense of the term “exploration” and suggesting four functional principles in support of exploration in digital collections — view, movement, contextualization, and participation. On this basis, we compare eight well-known museums with regard to the explore modes for their digital collections. We have devised a three-part methodology, reverse information architecture, to address the question: How is the function of exploration manifested in the structure and interface elements of digital collections? With this unique method we use the given content to investigate how far the four principles are implemented in explore modes of digital collections and, broadly said, how explorable they are. 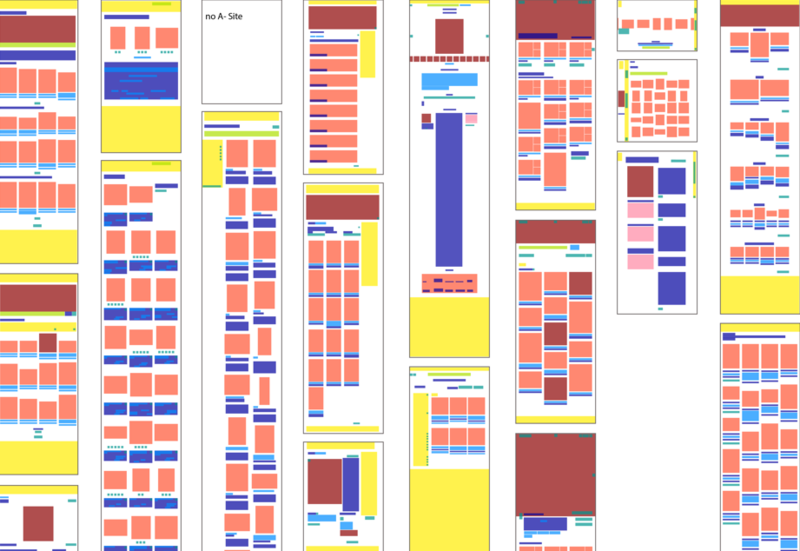 The introduced approach to studying digital collections could be opened up to other fields to analyze a variety of Web interfaces in general. Museen erweitern ihr Vermittlungsangebot immer mehr über die physische Einrichtung hinaus, u.a. durch die Bereitstellung Digitaler Sammlungen im Web. Digitale Sammlungen zeichnen sich dadurch aus, dass die in ihnen gezeigten Objekte speziell für das Web aufbereitet und präsentiert werden. Der Anspruch besteht dabei darin, die Gesamtheit der musealen Sammlungen zur Verfügung zu stellen. 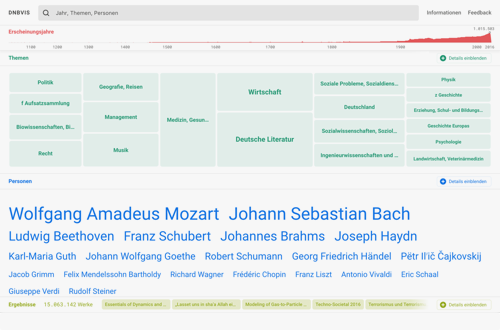 Um diese umfassenden Datensätze zugänglich und ein Schlendern durch die Bestände zu ermöglichen, wird innerhalb der Digitalen Sammlungen zunehmend ein sogenannter Explore-Modus angeboten. Auf der Basis einer Untersuchung des Begriffes der Exploration wurden im Rahmen dieser Arbeit acht bekannte Museen im Hinblick auf die Explore-Modi ihrer Digitalen Sammlungen miteinander verglichen und analysiert. Es wurde eine dreiteilige Methode mit dem Namen Reverse Information Architecture entwickelt, um die folgende Frage zu beantworten: Wie manifestiert sich die Funktion der Exploration in der Struktur und den Interface-Elementen der Digitalen Sammlungen? Mit der entwickelten Methode wird der Inhalt der Websites analysiert, um zu untersuchen, inwiefern Konzepte der Exploration in den Digitalen Sammlungen umgesetzt werden.